Towards the end of the nineteenth century, Japanese workshops began to expand their repertoire to include snuff bottles, probably in response to the growing demand from Western collectors of Chinese snuff bottles following the opening up of Japan to Western trade in the mid-1850s. 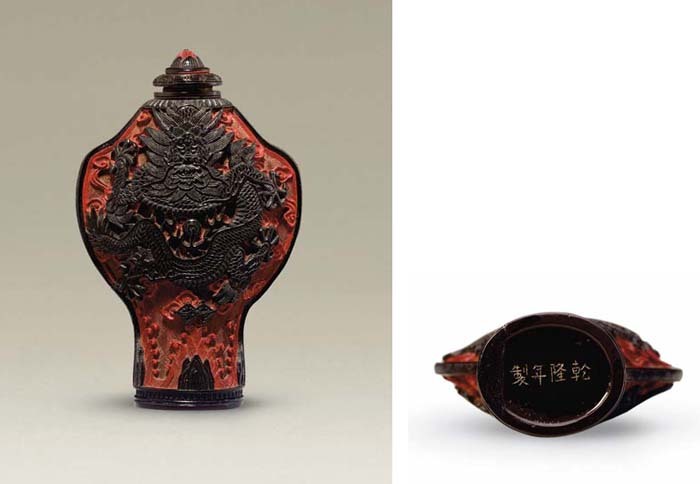 While commercial and artistic exchanges between China and Japan have been well documented through the centuries, Japanese snuff bottles were apparently marketed directly to the West. It is extremely rare to find them coming out of China. This exceptional red and black lacquer bottle is a masterpiece among a small group of carved lacquer snuff bottles purporting to be Imperial Qianlong products and carved broadly in Chinese style. For related bottles possibly by the same hand, see J. Ford, Chinese Snuff Bottles. The Edward Choate O'Dell Collection, no. 64, and Moss, Graham, Tsang, The Art of the Chinese Snuff Bottle. The J & J Collection, no. 316. For a range of bottles in lacquer, but in the Japanese style, see S. Cammann, Miniature Art from Old China. Chinese Snuff Bottles from the Montclair Art Museum Collections, no. 417; Pamela Friedman, Chinese Snuff Bottles from the Pamela R. Lessing Friedman Collection, no. 95; and Robert Hall, Chinese Snuff Bottles II, no. 24. The color combination of the rich, jet-black lacquer of the main subject juxtaposed against the vivid red ground is extremely effective and this unique form adds to the appeal of this particular example.